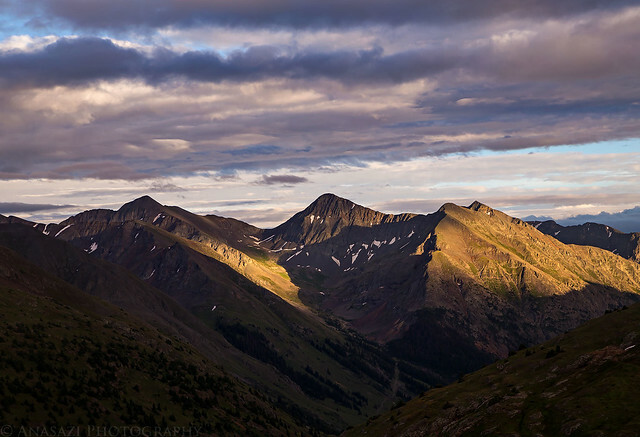 Houghton Mountain during a beautiful sunset in the San Juan Mountains. 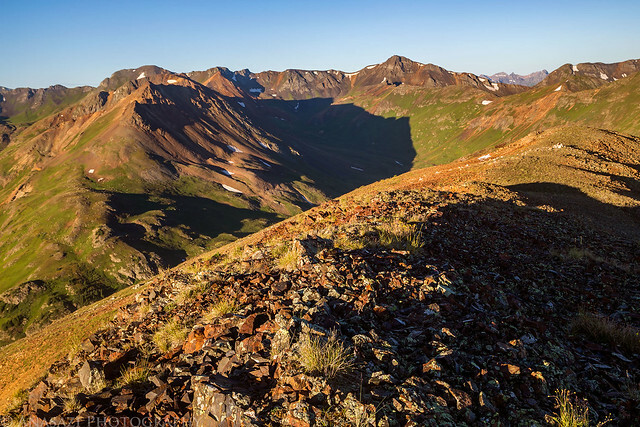 This weekend I headed down to the San Juan Mountains by myself to hike to the summit of a few mountains above the ghost town of Animas Forks near Mineral Point. 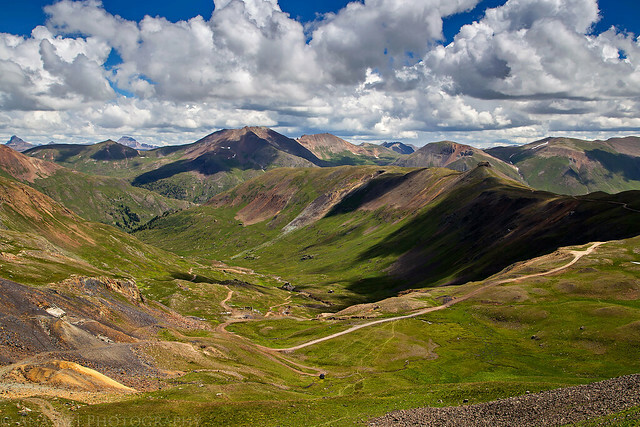 I left after work on Friday afternoon and after a quick dinner in Montrose I drove over Red Mountain Pass to Silverton. 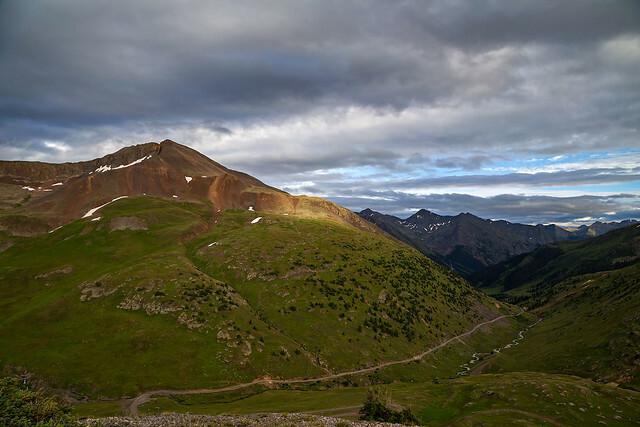 From there I followed the Animas River to the base of Denver Hill (12,300) so I could go on a late evening hike to its summit. 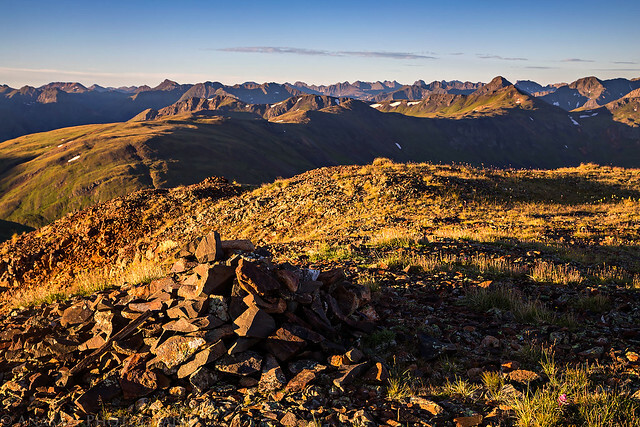 It was a short hike to the top, but it offered me some nice views of the surrounding mountains including Houghton Mountain (13,052), Seigal Mountain (13,274), Tuttle Mountain (13,203), Animas Forks Mountain (13,722), and Engineer Mountain (13,218). After hiking across the rolling tundra I reached PT 12340 which gave me a good overview of Mineral Point below and I caught a nice sunset on my way back to the Jeep. 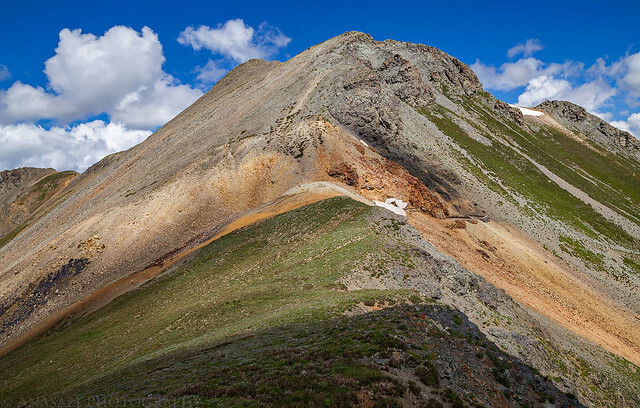 A view of Denver Hill above Denver Lake as I started hiking to the summit from the Engineer Pass Road. Looking down the North Fork of the Animas River with a little spotlight on Animas Forks Mountain. 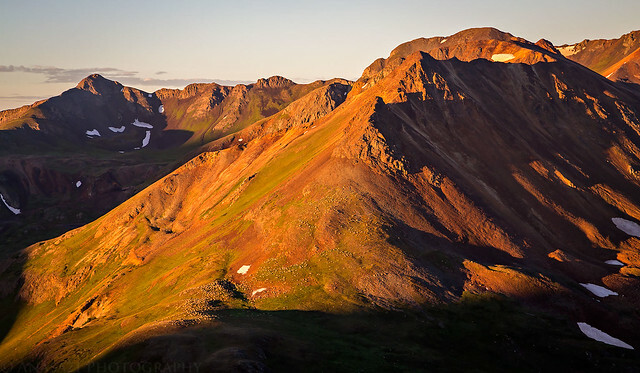 Nice evening light on Niagara Peak (13,807) and Jones Mountain (13,860) above Burns Gulch. There was plenty of water to be found between the two 12,000 highpoints. 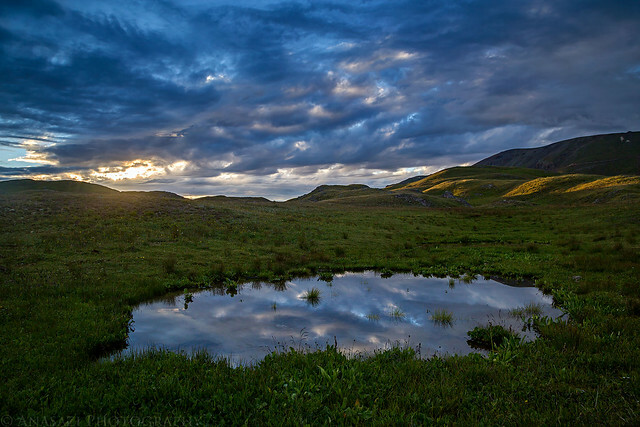 The sun peeks through a break in the clouds reflected in a small tarn in the alpine tundra. 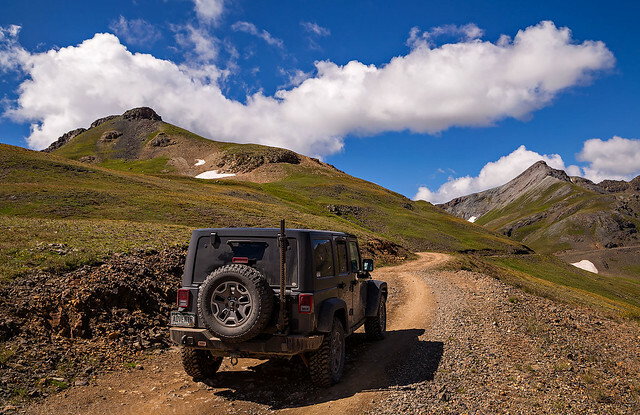 After returning to my Jeep I drove up the spur road that follows Burrows Creek and found a campsite for the night. It was very peaceful up here and I hadn’t seen anyone else all evening. I went to bed early so I could get an early start on Saturday morning. The sky had cleared up before I went to sleep, but during the night I woke up a couple of times to find that I was in the clouds and thought that I might be hiking in foggy conditions in the morning, but when I finally woke up for good the sky had cleared up again. I didn’t get up as early on Saturday morning as I usually do when hiking in the mountains since the weather was supposed to be good all morning and my planned hikes were not very long. I got up about a half hour before the actual sunrise, finished driving almost to the end of the road I had camped along and started hiking to the saddle between Houghton Mountain and Tuttle Mountain. 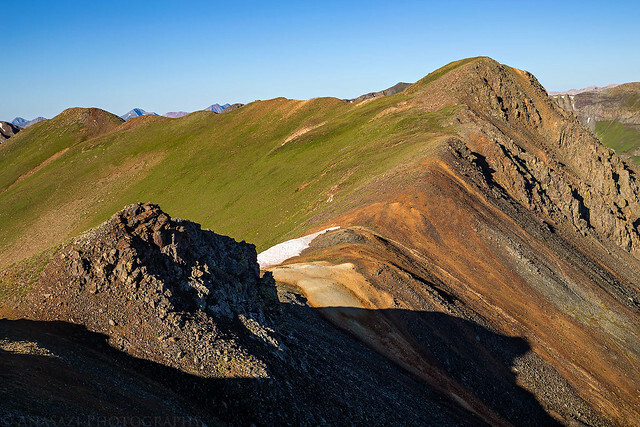 My plan for this morning was to climb both of these low 13ers that I have seen many times as I explored the Jeep roads in the area and climbed other nearby peaks. I started off turning left at the ridge and following it to the summit of Houghton Mountain. 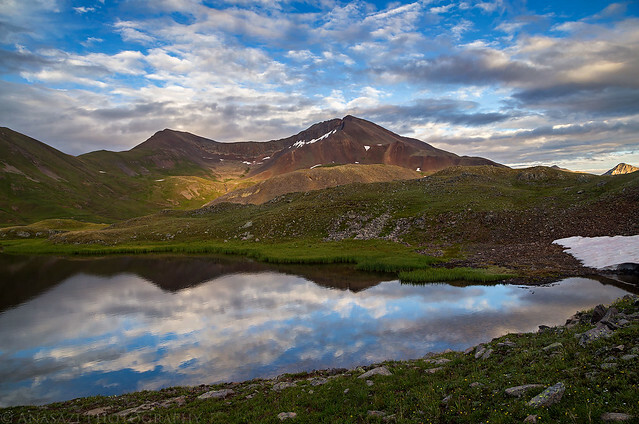 This peak has always interested me since dominates the view when visiting Animas Forks. It was pretty easy hiking most of the way with a couple hundred feet of elevation gain. As soon as I reached the ridge I could hear a flock of sheep that were across the gulch on the side of California Mountain (13,220). I would be able to hear them throughout the remainder of the hike which got a little bit annoying. While hiking along the ridge I got to watch the sunrise on Hurricane Peak (13,447) over California Gulch and Placer Gulch. 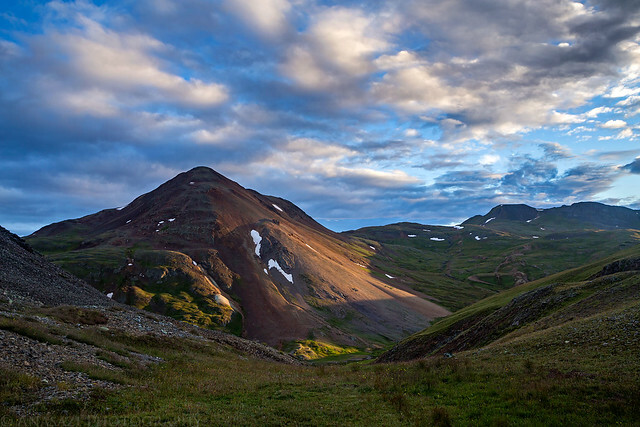 Sunrise on California Mountain. 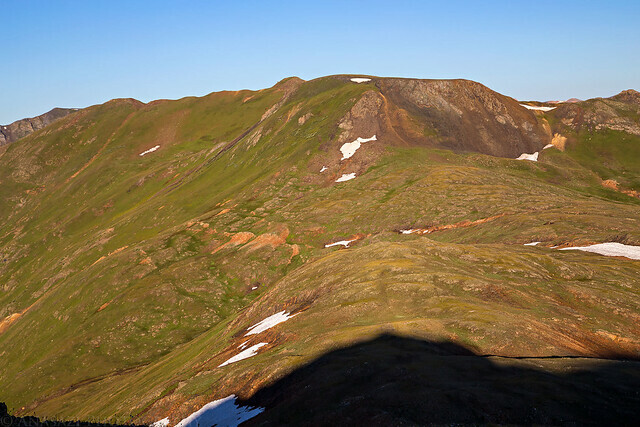 If you look closely you can see a big flock of sheep on the mountain above the shadow. View from the summit of Houghton Mountain. 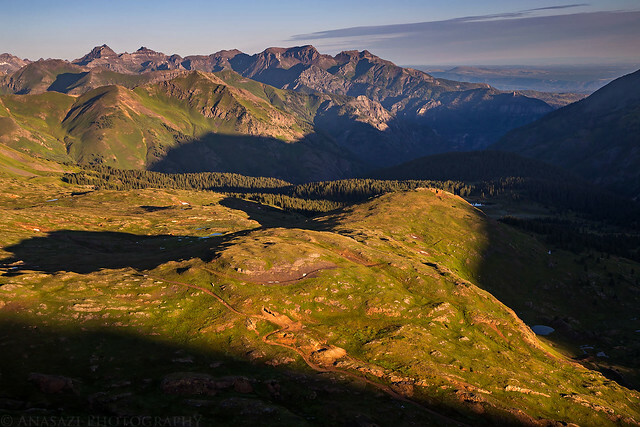 Looking down from the summit over the Mineral Point area toward the Sneffels Range on the horizon. You can even see my Jeep parked down below if you look for it. 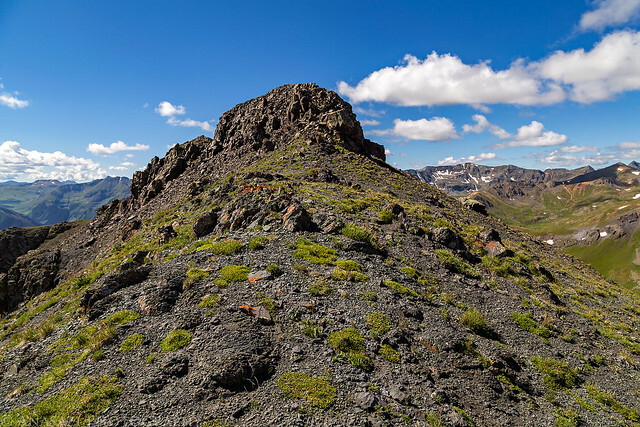 After reaching the summit and checking out the surrounding view I returned down to the saddle and then continued on to the summit of Tuttle Mountain. Most of the route was also easy, but there was one pretty steep section that slowed me down. From the summit I had a great view over Poughkeepsie Gulch to Brown Mountain (13,339) and Abrams Mountain (12,801) toward Ouray. 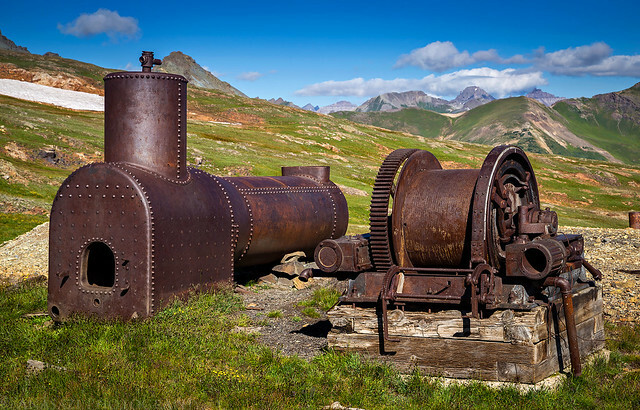 Instead of returning the way I had come, I hiked straight down the south face of the mountain to a little-used trail that passed a few old mines and brought me right back to the saddle again. Following the ridge back down to the saddle with California Gulch on the left. Back at the saddle and on my way to the top of Tuttle Mountain, the high point straight ahead. A nice view of Hurricane Peak from the ridge. The final ridge to the summit of Tuttle Mountain. A nice view from the summit towards Hurricane Pass, which I’ve driven over many times, and Lake Como. 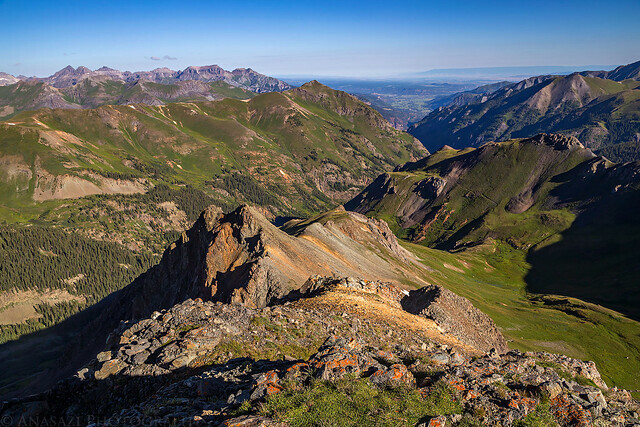 Looking the other direction down Poughkeepsie Gulch and following the Uncompahgre River towards Ouray and all the way to the Grand Mesa on the horizon. 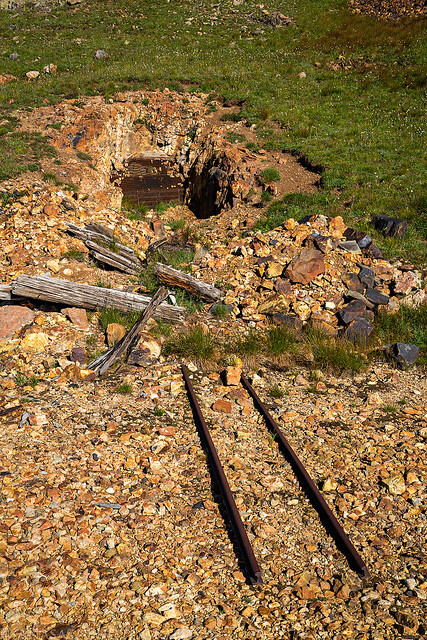 An old mine along the trail back to the saddle. 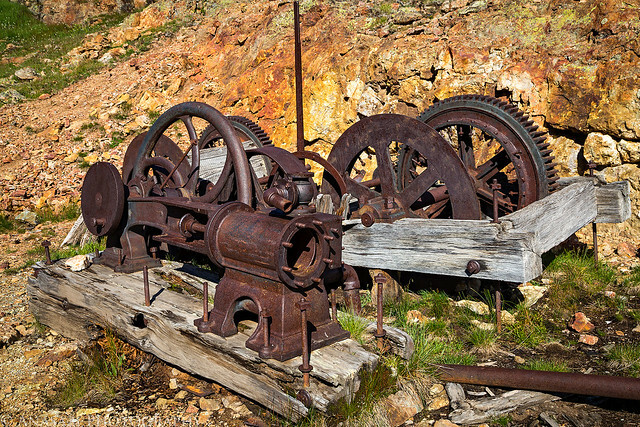 When I reached the road I also stopped to check out some old mining equipment in the area. 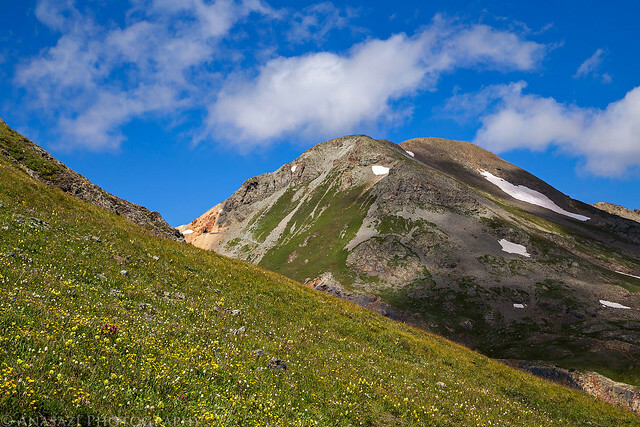 Since I finished the hike in the late morning and the weather was still looking pretty good I decided to try to hike at least one more 13er today. I drove back down to Animas Forks and then up the road through Placer Gulch where I would have to drive through the same flock of sheep that I had heard all morning. 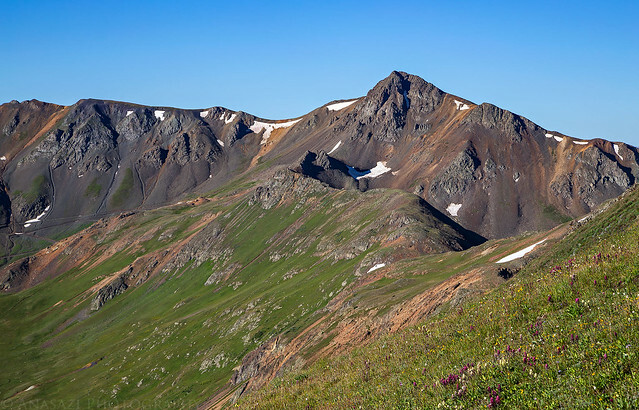 I parked near Treasure Mountain Pass above Parson Lake and hiked the short distance to the summit of PT 13075. Again, this was a short and easy hike, but there was a very short section of fun scrambling involved to reach the actual summit. My Jeep below PT 13075 on the left. 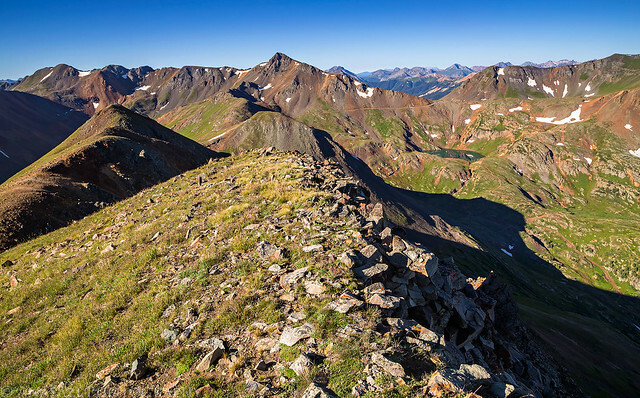 Here’s a view of the rocky summit that required a little scrambling. From the top I had a good view down Parson Gulch toward Dome Mountain (13,370) and Tower Mountain (13,552). Looking the other direction down Placer Gulch. I was hoping to be able to squeeze in Hanson Peak (13,454) today as well, so I headed over there next. 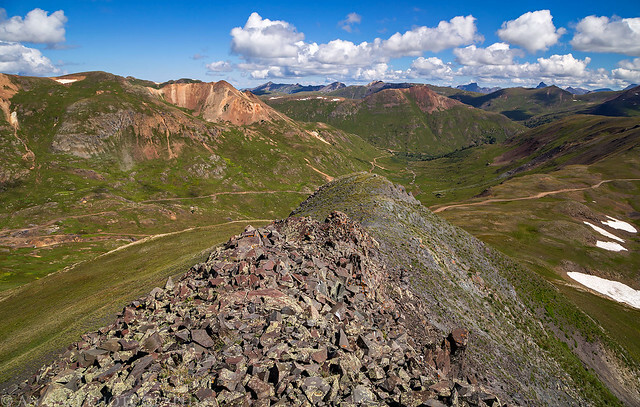 I drove up an old mining road to the first switchback and parked there and then climbed up a steep game trail to a saddle overlooking Eureka Gulch. 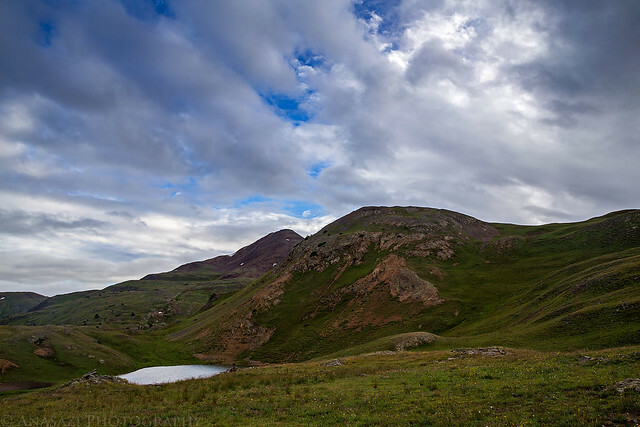 From there I followed the ridge toward the summit, but stopped about 300 feet from the top when I reached a very steep and loose section above an old mine because the weather wasn’t looking good and I decided to not take my chances. I will definitely have to return another time to try again. The ridge to the summit. I turned around near the reddish rocks straight ahead. Looking down Placer Gulch from the ridge with my Jeep parked below. 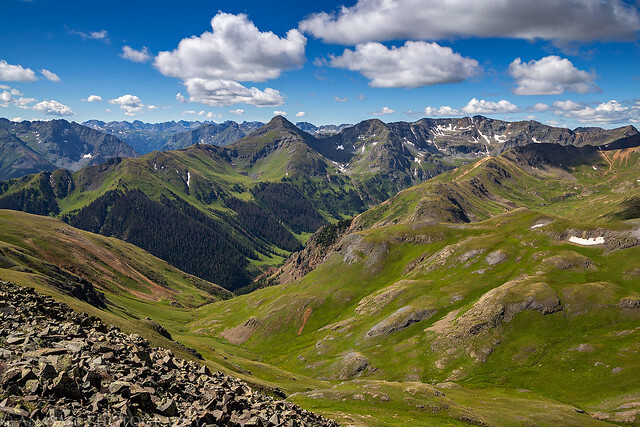 By this time I was starting to get pretty hungry, so I drove back down to Silverton and had a late lunch at the Kendall Mountain Cafe to finish off my day in this area. After lunch I would be driving west to Norwood so I could climb Lone Cone on Sunday morning.